Watching the Solar Eclipse was quiet an experience. Witnessing the totality was even more personal. In the peak of the afternoon – the scorching summer sun became so pleasant ; the temperature dropped ; the crickets became exuberant ; there was sunset all around and quiet an excitement permeated in the air. It was a surreal experience to witness a 360° sunset and right in the middle of the afternoon. High above, as the moon obscured the Sun, it was a sight to behold ! Totality is the only time during solar eclipse that can be enjoyed with out any additional protection to the eyes. 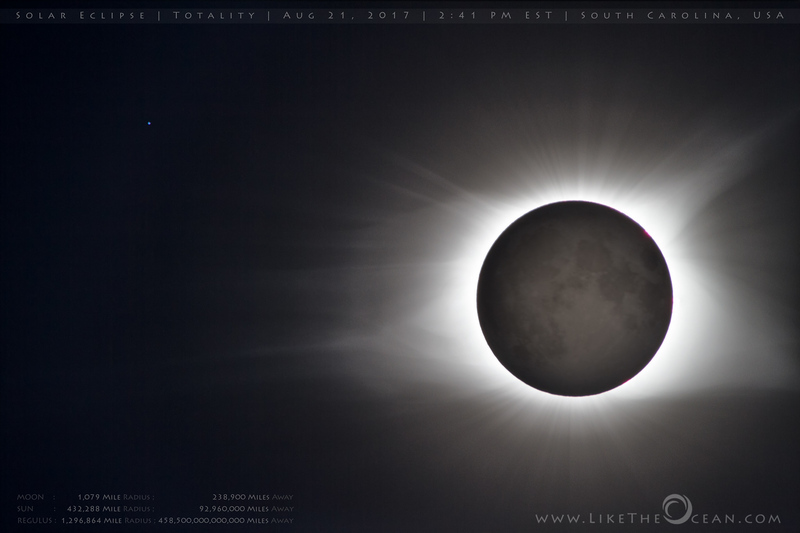 The Sun’s corona extends millions of miles into space and is most prominently visible during a total solar eclipse. Regulus, a bright star in the constellation Leo and among the brightest in Earth’s night sky. Due to its extreme brightness, Regulus can be spotted next to the sun’s corona, though its 79 Light years away.